They are called life jackets for a reason—they’ll help save your life in case you fell into the water and either didn’t know how to swim or you just happened to knock yourself unconscious in the process. The life jacket makes you more buoyant and brings you to the surface keeping your head above water until someone can rescue you or you can regain consciousness to self-rescue. For many the term life jackets and PFDs are used interchangeably. While there could be some differences based on the type of PFD that can actually be referred to as a life jacket, their job is the same and that is to keep you afloat. If you are a stand up paddle boarder, kayaker or canoeist, then it’s absolutely essential that you wear a life jacket before heading out in the water. In fact, it is among the most important pieces of gear that you can have. There are different types of life jackets including life jackets for boating, life jackets for kayaking and even women’s life jackets. The right one for you will depend on your preference, size and type of water sport activity that you are taking part in. This life jacket buying guide teaches you all you need to know on how to choose life jacket. let’s begin, shall we? Most life jackets that you will come across are standard life jackets. However, you might find that the inflatable life jacket is best suited for you. let’s look at each type individually to understand the main differences between the two below. These feature a flotation material that often consists of foam. They are also labeled as Type III USCG-approved PFDs. Standard PDFs are designed like a vest and are most commonly used by stand up paddle boarders, canoers and recreational kayakers. There are some benefits to using standard life jackets. First is that they require minimal maintenance and all you ever really need to do is to keep it out of direct sunlight, then store it away. However you should also know how to clean life jackets before storing them for the next time you need to head to the water. The standard life jacket is also designed to be inherently buoyant. This means that there is no action required on your part to activate the jacket when you fall into the water. Standard PFDs can be used in many different types of water activities such as fishing or waterskiing. And lastly, you also get pockets which you can use to stash gear such as tools, snacks and fishing gear. However as is with anything else, standard life jackets come with their own fare share of disadvantages. For one they can get quite warm and uncomfortable during hot days and this is especially so when stand up paddle boarding. For some people, standard life jackets also tend to feel bulky and could restrict movement when paddling. Similar to the standard PFDs, Inflatable PFDs are also often used when canoeing, kayaking or stand up paddle boarding. They feature a waist pack or a vest design. Unlike the standard PFDs that might feel bulky, these have a slim profile when uninflated making them lightweight and comfortable to wear. Depending on the design, inflatable PFDs are usually labelled as ether Type III or Type V USCG-approved PFDs. You can inflate an inflatable life jacket in two main ways. The manual method requires you to pull on a chord which then activates a cartridge containing carbon dioxide. The second way to inflate the jacket is using the automatic method. This method activates the life jacket as soon as you hit the water. Due to the chance of water coming into contact when kayaking or canoeing, inflatable life jackets are best suited for stand up paddle boarding. We noted that one of the advantages of an inflatable life jacket is it’s much more comfortable to wear. This is especially so during hot summer days when you are trying to keep cool. Their small profile when uninflated means that they have less cover on your body. That said, there are still some disadvantages to using inflatable life jackets. The first is that they require you to inflate them yourself for them to work. If you are unconscious or injured, this obviously poses a problem. There is more maintenance with the inflatable PFDs to make sure they are working properly. You will need to change the CO2 cartridge after every inflation. Inflatable life jackets can only be used in less impact water sports such as kayaking, stand up paddle boarding or canoeing. They are however not suited for white water rafting, or water skiing. For that you will need special life jackets for watersports. There is another type of life jacket known as hybrid PFDs. These combine the features of both the standard life jacket and the inflatable life jacket. Hybrid life jackets have air chambers that boost buoyancy while also making the jacket more lightweight and comfortable for the user. When it comes to choosing the right sized PFD for you, the most important consideration will be your chest girth and not your weight. On the other hand, the best life jackets for kids will be based on their weight. Start off by measuring the circumference of the thickest part of your chest and then use the recommendations by the manufacturer to pick the right PFD. Start by unstrapping, wearing then strapping it on. How does it feel? is it too tight or does it feel comfortable. When selecting the inflatable PFD, wear it over your head or on your waist depending on its design. It’s always a good idea to have someone with you when choosing a PFD. They can pull it up by the shoulders to see how far it goes. You can tighten the straps if the PFD goes above your head or the nose. However, if it still gets as high as your nose even after tightening the straps, this means it’s too large for you and you need to choose a smaller PFD. The right life jacket needs to feel comfortable and snug but not too tight to restrict movement. A point to note is to wear clothes when trying out your life jacket. These should be clothes that you would normally wear when paddle boarding, canoeing or kayaking. If there are model paddle boards, starter kayak or inflatable canoes at the store, get in and mimic a paddling movement to find out how the life jacket feels. But what if you plan to bring your dog along when kayaking, paddle boarding or canoeing? Of course, you will need to get a PFD for the dog as well. Ensure it fits correctly and is comfortable and snug. Also, learn how to choose life jacket that has a low profile. This has a lesser chance of getting caught on a snag. Make sure it features a handle to help pull the dog out of the water easily. And lastly, find a dog life jacket that has easy to release buckles. Different PFD models come with different features and specifications. Depending on your type of water activity, the right features can make the whole experience enjoyable and convenient. This life jacket buying guide looks at the features and specs that you need to look for. Check for pockets. Often standard life jackets will feature pockets of different sizes. Depending on the gear that you want to bring along, ensure that the pockets are the right size. Look for bright colors on your PFD. This makes you easily noticeable on the water which significantly improves your chances of being rescued. A reflective layer on the life jackets will improve visibility especially when the light goes down. Also check for tabs. These will help you attach and carry a knife, whistle as well as other accessories that you will need during your water sport adventure. The tabs can be situated at the front or at the back of the life jacket. Ventilation will improve air circulation and enable the body to get rid of excess heat especially during the summer months. If you are planning on fishing, there are specially designed fishing life jackets that feature a loop for your rod, tool hangers as well as a portable table for those lures and multiple flies. These is where the numbers come in. The first thing that you need to check is the floatation of the life jacket. To keep your head above water, a person needs a minimum of seven pounds of floatation. Also known as buoyancy, the great thing is that majority of life jackets offer a floatation greater than this number. Due to this very fact, you don’t have to concern yourself with the buoyancy. It however makes it easier to compare different life jackets and know how to choose life jacket with the best floatation. If you still want to test the buoyancy and effectiveness of a life jacket before buying one, this is what you need to do. First wear the life jacket and enter the water. Ensure you cannot reach the depth with your feet. Relax and allow your body to tilt backwards. The best PFD should ensure that your chin is above the waterline and that the breathing is easy and comfortable. If you find that your mouth is getting under the water, then this means you need a life jacket that has more buoyancy. Factors that will affect the buoyancy of the life jacket include clothing, weight of the individual, lung size as well as body fat. There are two main types of materials used to make life jackets. These are nylon and neoprene. The nylon life jacket is much more affordable and is the more common type of jacket that you are likely to find with paddle sports. The fact that it is so lightweight makes it comfortable to wear. It also allows for greater arm movement allowing you to paddle with ease. When doing water sports such as water skiing, knee boarding or tubing you want to go for a neoprene life jacket. It is more expensive than a nylon jacket but offers greater buoyancy and is comfortable to wear. One of the most important factors to consider when buying a life jacket is what type of water sport you plan to take part in. We’ve mentioned this time and again throughout this life jacket buying guide. 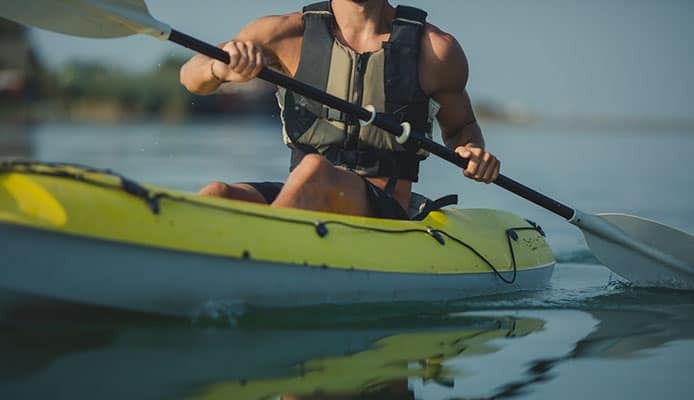 While a life jacket can be versatile and used for different watersports, buying a model that is specifically designed with the type of sport in mind means that it is comfortable to wear and simple to use. If your water sport of choice is getting on a canoe or a kayak, then you will need a specially designed kayak life jacket. They have a shorter profile which allows you to sit comfortably. Most will provide enough clearance from the seat and spray skirt all while being remarkably buoyant and comfortable to wear. These often come with a camouflage pattern to help keep you concealed when in the brush. Fishing life jackets are as the name suggests, designed for fishing and feature holes, loops, and plenty of pockets for storing your fishing gear. You can never be too safe and research shows that up to 80% of people who drown every year are not wearing a life jacket. To ensure that you and every member of your family is safe guarded in case they fall into the water, ensure that everyone has a life jacket. And don’t forget the family pet as we saw there are life jackets designed for dogs as well. There are plenty of things that you will need to consider when buying a life jacket. From picking the right size based on your chest girth to picking one for your four-legged bestie. Life jackets can be, and often are the difference between life and death when out on the water.